Hello Monday, I have been dreading you all weekend. I finally spent some time putting my entertaining hat back on and had a few friends over for some fall cocktails. More of that later this week, but I thought a little tip would be a nice way to start the week. 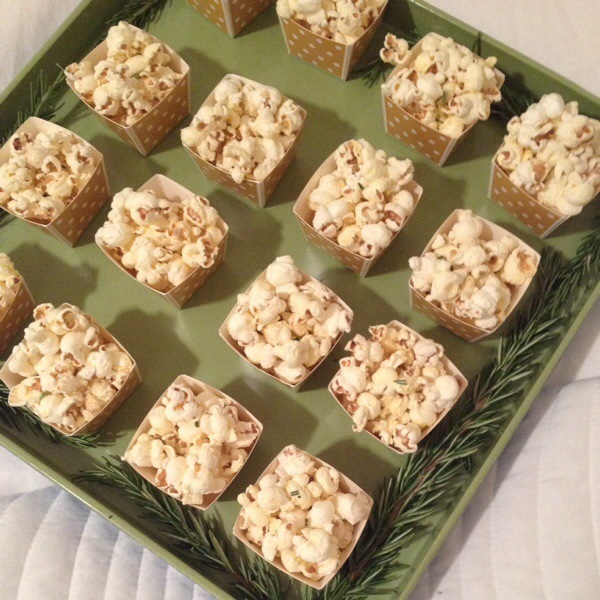 I was pulling together my menu and really wanted to make the rosemary popcorn recipe I found last last week. Displaying it in a big bowl just didn’t seem like the right for a cocktail party. So, after a little digging at my local HomeGoods store, I found these small baking boxes that were the perfect size for a single serving. Sometimes it isn’t about what you are serving, it’s about how you serve it that makes it special. You could use these a variety of cocktail nibbles and the best part, no dishes to clean after. I prefer to use a variety container sizes in neutral patterns with cloth napkins verses buying paper plates and napkins. It ends up costing me the same in the end, but the presentation looks more polished. Would love to hear about some of the containers you like to use for individual servings? Happy Monday! I love that you said “sometimes it isn’t about what you serve, it’s about how you serve it that makes it special.” I’ve really come to believe that as presentation can make all the difference. I find it adds a certain extra level of excitement to a dish that could be as ordinary as popcorn 🙂 thanks for sharing!